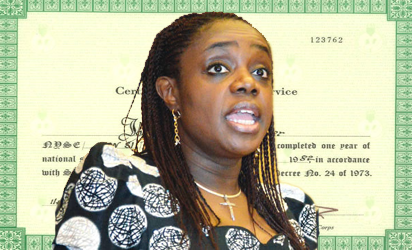 LAGOS—In its first public reaction to the forgery allegation levelled against the Minister of Finance, Mrs. Kemi Adeosun, the Presidency, yesterday, said the allegations were unproven, noting that naysayers were bent on nailing her irrespective of investigations. The Presidency’s assertions were immediately dismissed by the opposition Peoples Democratic Party, PDP, which said the administration had come to its wit’s end and that the Adeosun episode portrayed the administration as fraudulent. The Civil Society Advocacy and Legislative Centre, CISLAC on its part, urged administration officials not to speak any further on the issue, saying it does not give hope for the fight against corruption. Mrs. Adeosun was alleged to have presented forged Exemption Certificate from the National Youth Service Corps, NYSC, as part of her credentials to the Senate in an investigation conducted by online newspaper, Premium Times, and published 66 days ago. The NYSC and the Minister of Information, Alhaji Lai Mohammed, had in separate assertions, claimed that investigation into the matter was ongoing. Senior Special Assistant to the President on Media and Publicity, Mallam Garba Shehu, while appearing on African Independent Television, AIT, morning show, Kakaaki, yesterday said: “The Minister of Information has spoken on the matter. And a process is ongoing to address the allegations. When that process is completed, Nigerians will know the outcome. “Some people want a particular outcome, and because they are yet to see this outcome, they are not happy. Give it (investigation) time. There is a process ongoing. Tasked on the length of the investigation which reportedly commenced at the time the allegation first broke 66 days ago, the presidential spokesman said: “It is not for me to decide (the duration). I don’t have the full facts of the matter, so why the investigation is not out, I don’t know. I hope there will be an early outcome. Responding to the development yesterday, PDP spokesman, Mr. Kola Ologbondiyan said: “They have come to their wit’s end in their game of deceiving Nigerians, that is why they can say that they are still investigating. CISLAC Executive Director, Mallam Awaal Rafsanjani, in his reaction, said: “We call on people who are in authority, particularly the current government when they are making statements because they used all sorts of manner to attack other people in the past and it will be counterproductive if people who are on their side are found doing what they used to attack people of doing. “This is not good for people who want to fight corruption or who want to sanitise governance in Nigeria. So, we call on them to always be careful of the kind of statements that they come up with because it is very clear that the woman has not done her NYSC, and in an honest society, this woman should not even wait to be asked to go, she should just step aside and allow investigations to go on. “You cannot be investigating somebody of this kind of nature, and the person is still serving. This does not show seriousness, and this is watering the anti-corruption war.